Brought to you be those people over are Metrodome, Blood of Warriors: Sacred Ground is an historical epic set in 18th century Thailand at the time of the Burmese invasions, mixing style from 300, Crouching Tiger hidden dragon and Hero to create a story that is unknown to those outside of Thailand. Inspired by the true events of the Bang Rajan rebels, a warrior tribe who fought to defend their land against a terrifying imperial military force hell-bent on destroying everything in their path, this incredible story is the stuff of legend. With only their sharp wits, a strong spiritual knowledge of martial arts and a ferocious set of fighting skills to defend themselves, these warriors set about bringing a vast army of bloodthirsty invaders to their knees. Directed by Tanit Jitnukul, who also made Bang Rajan, a film which accounts the true events of the village uprising of the Bang Rajan rebels against the Burmese invaders and the time before the fall of the old capital of Thailand, Ayuttaya, Bang Rajan draws on the legend of a village of fighters who bravely fended off the Burmese armies. With no support from the Royal army, the villagers drive the invading Burmese back away many times until their names have become legendary during the time. These actions by the people of Bang Rajan then inspire other villagers to fight as shown in this film, Blood of Warriors. The film is set after the fall of Ayuttaya and at a time when many tribes and villages are at odds with each other on what action to take against the invaders. One village led by a wise buddhist monk and with the help of his warrior tribesmen bring the villagers together to stand and fight against the Burmese. 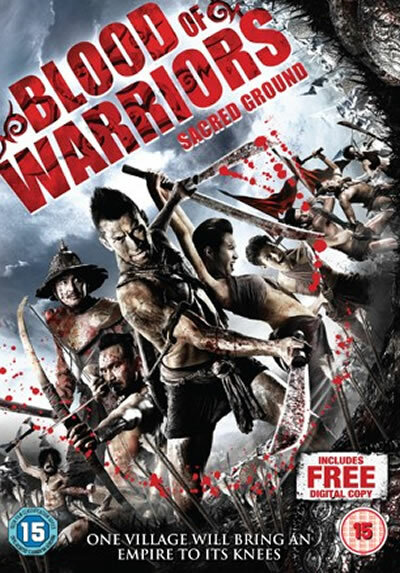 An interesting tale that is unknown in the west, but is the stuff of legend within Thailand, Blood of Warriors has a mix of styles that will be familiar to many, taking ideas from Zack Snyder’s 300 and Ang Lee’s Crouching Tiger, Hidden Dragon. With much to enjoy in this film it is worth checking out if you’re looking for something different. The competition is now closed and the winners will be notified in due time. Thank you to all that have entered. Look out for more competitions coming to Attack From Planet B in the future.